Sony VPL-VW270ES review | What Hi-Fi? If content is king, context is next in line to the throne. Without any context, you may think £5000 for this Sony VPL-VW270ES 4K projector sounds a bit steep, considering they can be picked up for a fifth of that price nowadays. But that doesn't consider the whole picture. 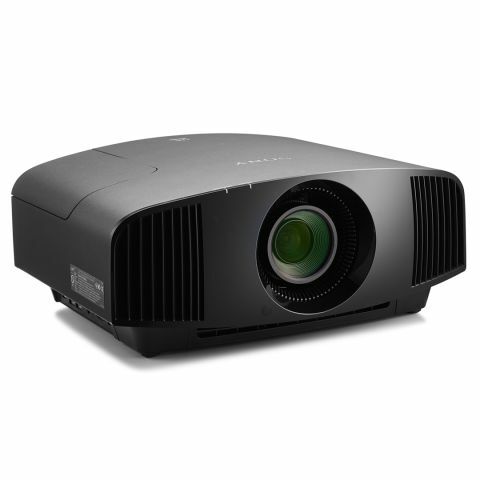 The Sony VPL-VW270ES is a ‘true’ 4K projector, using 4K-resolution chips as opposed to 'faux-4K’ methods of pixel-shifting and enhancement technology. It’s also the most affordable projector in the brand’s long and successful native-4K line. The previous model, the five-star Sony VPL-VW260ES, cost £200 more and is now discontinued. In its place is this VPL-VW270ES, which Sony introduced earlier this year alongside the VPL-VW570ES (£8000) and pro VPL-VW870ES (£25,000). If you’ve noticed that it receives a five-star review, you may be feeling better about the price. But how does this Sony justify itself in a world where 4K projection is becoming increasingly accessible? As with its predecessor, the Sony VPL-VW270ES has a 4K SXRD panel projection system, with native 4K (4096 x 2160) resolution and support for HDR10 and HLG (Hybrid Log Gamma). The picture’s stark crispness and clinical cleanliness are the first signs of the Sony’s superiority over more affordable faux-4K rivals. We play Life Of Pi on 4K Blu-ray and the VPL-VW270ES offers the kind of sharpness we haven’t witnessed on our projector screen since we reviewed its predecessor. With this new model, improvements have been made to the panel’s reflective silicon layer for better reproduction of shadows and blacks. Sony has evolved its ‘Motionflow’ mode for smoother motion performance, too. Its 1500-lumen output feels more than bright enough when our test room lights are dimmed right down – the likely environment for a projector of this price and calibre. However, with the lights on, it doesn’t fare quite as well as a high-brightness projector (say, 3000-lumen) would. Those familiar with the lights-out black levels offered by OLED TVs and the sheer brightness capabilities of QLED and LCD TVs may not raise eyebrows at the Sony’s capabilities in these areas. But by projector standards, contrast across the spectrum is exemplary – as is highlighted by the darkness of the night and sea and when stars and creatures glow intensely against it. In such high-contrast scenes, detail emerges from darkness, with nothing lost to shadows or sacrificed for black depth. To give you an idea, the Sony’s contrast level is similar to that of a decent LCD TV. Regardless of what’s on screen, insight on the whole is excellent. Solid colours are among the Sony’s strengths, with not only the differentiation of tones but also the layering and richness playing into the hands of the disc’s HDR. There’s twinkle in the stars and variations of colour in sunsets, and splashes of colour stand out vividly in a frame that is largely occupied by drizzly conditions and beige clothing. Of the nine picture modes – all of which have a dedicated button on the remote – we prefer ‘Cinema Film 1’, which offers the best contrast, brightness and colour balance for our tastes. We still find ourselves tweaking a little: bumping up brightness slightly and preferring ‘contrast enhancer’ on ‘low’. And what of Sony’s improved Motionflow? ‘True Cinema’ gets our vote for effectively producing a stable and solid picture, however those particularly sensitive to the artificialness of frame insertion may prefer it off altogether. Our testing schedule means we can compare the Sony with a five-star, 4K-supporting (not native) Epson projector that’s less than half the price. Play Star Wars: The Last Jedi on Ultra HD Blu-ray through the two projectors, and the Sony’s picture gleams in comparison, much sharper and more capable of visual splendour. We swap the 4K Star Wars disc for the standard Blu-ray one, and the Sony almost seems to welcome the idea. During the crawl, the solid yellow hues of text against a decently-black space backdrop are strong, and that penchant for richness is evident with explosions, the island’s lush green grass, the orange pilot boilersuit and gleaming lightsaber handles. Overall, it’s a carefully considered and stable picture. That’s also the case as we play a DVD of Edge Of Tomorrow. Much to our delight, it offers a hugely watchable performance with admirable clarity and colour punch, as richly-coloured army uniforms, shiny helmets and blazing battlefield take up the screen. Some noise creeps in to remind us of the format, but given the upscaling task, the Sony handles it very well indeed. When the Sony has been unpacked, a 2.06x motorised lens and powered controls mean it can be set up simply by using the remote, negating the need for you to turn lenses and twist dials. There are 2.1x zoom and focus controls, and a lens shift option which means you can fine-tune the image precisely. The 1.36:1 to 2.16:1 throw ratio means it can beam a 100in screen from a 3.05m to 6.28m distance from the screen, or a 120in screen from 3.67m to 7.55m. Sony claims the VPL-VW270ES has been optimised with gaming in mind. Support for 60 frames-per-second 4K playback and beefed-up processing power, with faster response speeds and reduced input lag, will no doubt have gamers interested. With its active 3D support, the Sony will also appeal to the niche crowd of those who still watch the format. The glasses aren’t supplied, and at a hefty £50 each, that’s a shame, but we doubt it will trouble many owners, who will no doubt find satisfaction with the rest of the Sony’s offering. The Sony VPL-VW270ES projector does its lineage proud, upping the picture game slightly while shedding a few pounds. Though you can get ‘4K’ projectors for less money, none do the resolution quite like this Sony. It promises a scintillating home cinema experience, and delivers just that.